What can campers do at Buck's Rock Camp? Glassblowing, Theater, Culinary Arts, Ceramics, Video, Woodworking, Animal Farm, Batik, Book Arts & Papermaking, Comedy: Improv, Standup & Sketch, Computer Arts/Maker Shop, Costume Design, Dance, Flameworking, Leather, Lighting & Sound Design, Metalsmithing/Jewelry, Music, Painting & Drawing, Photography, Printmaking/Silkscreen, Pulication/Web Design, Puppetry, Radio Broadcasting, Recording Studio, Sculpture, Set Design, Sewing, Sports, Vegetable Garden, Weaving/Textiles. All shops are available to all campers. Nestled in the foothills of the Berkshire Mountains in central Connecticut, Buck’s Rock Performing and Creative Arts Camp is like no other summer, arts, sleep away program. We are a low-key, non-competitive haven where young artists, ranging in age from 9 to 18, are free to choose their own creative and performing art projects and activities, while working alongside professional artists and teachers in fully equipped studios. We share the principles of Maria Montessori, and have always believed in young peoples’ ability to structure their time intelligently and make self-directed choices that tap their inherent interests most productively. Under towering oak and maple trees, our teen and junior campers discover their passions, find their voice, and experience the exhilaration of endeavor and accomplishment. Fascinating to watch — challenging and uniquely satisfying to do! From molten glass to finished piece, there is nothing like the experience of working in our Glass Studio. 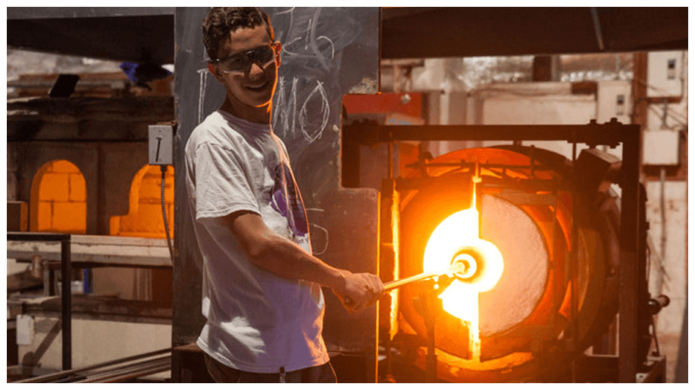 This studio is professionally equipped and staffed and boasts one of the most innovative furnaces in North America — specially designed for our young glass blowers. The Buck’s Rock Glass Studio is one of the few places in the country where young people can learn this medium. We can’t say enough about theater at Buck’s Rock – one of the most popular programs offered. For campers interested in acting training, our professional and exceptionally talented theater staff works hard to provide unmatched opportunities for growth and development. Over the course of the summer, approximately ten widely varied, fully mounted plays and musicals are staged in one of our two fully equipped theaters –the Summer Theater, a large, covered proscenium outdoor space or the Actor’s Studio, a large, but more intimate, indoor space. In addition to acting in plays, campers can improve upon skills and learn acting techniques. There is nothing quite like creating a piece in our Sculpture Studio. Large-scale or small, the creative process inherent in designing and executing in three-dimensions is like no other. With guidance and instruction from our expert staff, campers execute their visions in a variety of materials –plaster, wood, steel, aluminum or any combination. Our open-air studio is fully equipped with acetylene and arc welders, plasma cutters, air-system tools, hand and power tools, and a foundry facility. From an everlasting bronze cast, to an ephemeral installation of natural materials, this shop is non-stop cool. Music for pleasure and fulfillment abounds at Buck’s Rock. Our Music Studio boasts an orchestra, chorus, vocal jazz, rock and blues and jazz bands. We have jazz and classical ensembles, madrigal singers, a cappella groups, improvisational jazz and brass, string and percussion ensembles. A full guitar program, plus instruction in all strings (acoustic and electric), brass, reed, woodwinds, percussion, voice, and piano are also offered. Concerts, recitals, open mic and rock fests take place regularly, while field trips to Tanglewood and other music festivals help enrich the music experience. Throw a bowl on the wheel or hand build a pot in our well-equipped Ceramics Studio. Make a ceramic tile, create a sculpture, a fountain, a bird house and more. Use electric and kick-wheels and fire your piece in one of our gas or electric kilns. Use a slab roller, make your own glazes, and learn raku firing. The possibilities are endless, not to mention inspiring. Full Season - Age 10-18. First Session - Age 10-18. Second Session - Age 10-18. Six-Week Session - Age 10-18. Junior Camper Program - Two-week program for 9 and 10 year olds. -OPEN HOUSE: Saturday, May 19th 2018 – 1:00pm to 4:00pm. Email info@bucksrockcamp.com for more information. -If space is available, First-Session and Six-Week Buck's Rock campers may elect to extend for 2 or 4 weeks for an additional fee. -Pickup and drop-off is available from La Guardia or JFK for a $100 fee. Since 1942, our mission is to provide a safe, non-competitive environment where campers age 9-18 have freedom of choice to explore the performing and creative arts taught and supervised by professional artists so that they can not only learn who they are as artists, but more importantly, who they are as human beings. Daily classes in our beautiful Dance Studio, equipped with a sprung wood floor and Marley floor, meet every camper’s interests regardless of experience. Technique classes on all levels are offered in modern, jazz, ballet, hip-hop, choreography, improv, partner dancing and even yoga. Stretch classes and individualized coaching strengthen our dancers’ skills. 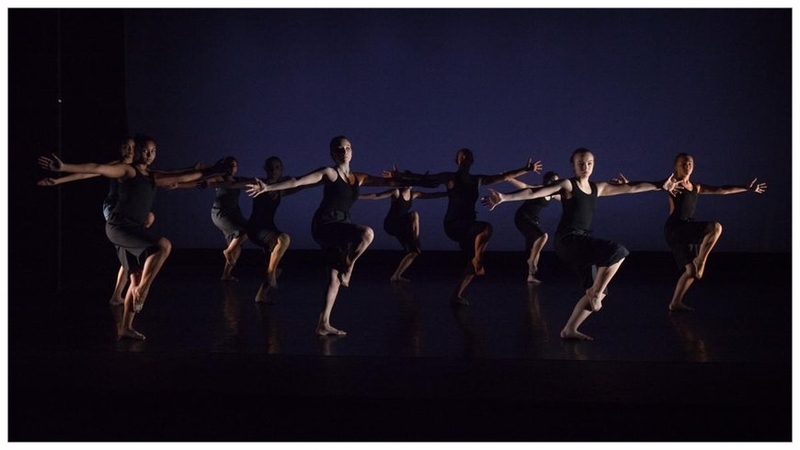 Any dancer interested can perform in our fully-mounted dance productions or in the end of the summer’s Festival. Buck’s Rock has an extensive computer shop equipped with a network of PCs and Macs. Instruction is available in professional design software such as Adobe Photoshop, Illustrator, Painter, Bryce 5, Dreamweaver, Flash, as well as quality tools like Blender and Google Sketch. Campers can make a wide variety of projects including 2D and 3D animation and graphics, websites, and video games. A high-speed Internet connection, scanner, and drawing tablets are also available to aid the creation of projects. The Costume Shop designs all the costumes for Buck's Rock's summer theater and stage performances, dance recitals, clown shows, video projects, music performances, and more. High school age and junior campers are welcome to help with shows in roles such as assistant designers, make-up designers, costume sewers, and wardrobe runners. Campers are indispensable on show nights and dress rehearsals, helping with costumes and makeup. Campers from teenage on down to juniors who are fascinated by the art of cooking will find lots to love about Buck’s Rock’s fully-equipped Culinary Arts Studio and Kitchen – a newer addition to our creative arts program. With our experienced instructors and visiting chefs, campers will explore the secrets of cooking and receive valuable insights into the culinary arts. Some of the activities include orientation to equipment use, baking through good techniques, principles of sauces, preparation in cooking and presentation, in addition to exploring ethnic and cultural dishes from around the world. Campers will be able to take their recipes and digital pictures of their dishes into our new computer lab to make their own cookbook. Then they can tempt their family and friends at home with their delicious new skills. Of course, all the work, excitement and fun of producing a play do not belong to the actors alone. Buck’s Rock has a large technical theater department where campers benefit from the unique opportunity of working behind the scenes with our professional staff. Our stage lighting and sound systems, operated by campers and supervised by our technical staff, are as elaborate and sophisticated as those of most summer theaters or off-Broadway stages. Campers may also work with our professional stage crew to help build and furnish the worlds in which our actors play their parts and in our fully equipped and staffed Costume Shop to design, create and prepare the wardrobes for all our performing arts productions. The Wood Shop at Buck’s Rock is as fully equipped as any master craftsman’s workshop, with power and handtools, lathes, joiners, saws, sanders and routers along with a rich assortment of hard and soft woods. Furniture pieces such as cabinets, desks and tables, and other items such as bowls, chess boards, musical instruments, baseball bats, boxes, rocking chairs and stools are among some of the projects designed and executed by campers. Campers provide the inspiration for a project and are expertly guided through the production process. Quite simply, the Standup Comedy program is where teenage and junior campers come to learn how to be hilarious. Or if they're already hilarious, it's how they learn to show people how hilarious they are. Through discussions and brainstorming and other activities that sound very business-like but are actually a whole lot of fun, campers learn how to write jokes, put together a standup comedy set, and perform in front of adoring fans. In combination with our Improv program, kids learn all aspects of physical and verbal humor. In our brand new, state-of-the-art shop campers will learn how to use the latest technology to develop and hone their creative photography skills. Topics covered include: using digital cameras, manipulating images with Photoshop and working with professional lighting equipment. The Digital Photo Shop also has a lighting studio that teaches campers how to use lighting equipment to enhance and shoot portraits and projects they made in our other studios to produce a professional portfolio of work. In our popular Metalsmithing & Jewelry Making Studio, you can design and create wearable art pieces, hollow forms and small sculptures in silver, bronze and copper. Make jewelry set with semi-precious stones or beads made in the Flame Working Studio. Workshops in casting, enameling and other metalsmithing techniques are offered throughout the summer. In the Video Shop, campers have the opportunity to create films and explore their interests in acting and cinematography using state-of-the-art, professional digital equipment. It is both a visual and performing arts shop. Write your own scripts, cast your productions, create your own storyboards, direct and shoot your own films. With the uncut footage you can then work on post-production editing using our Final Cut Pro editing stations. Our qualified instructors assist in the production of the videos and encourage you to explore new directions. From script to screen, the Video Shop will help a camper’s digital dreams come alive. The Animal Farm offers an alternative experience to many of the other shops. Campers may choose to adopt an animal at the start of camp, which then becomes their responsibility and playmate during the summer camp session. Opportunities are available to learn to milk a goat, bottle feed a calf and to learn about basic biology and animal care. The Animal Farm is also a nice, quiet place to spend time, read or even sketch and paint. Buck’s Rock’s Clowning & Improvisation Studio is so much fun. Incorporating traditional clowning, improv, sketch and stand-up comedy, campers explore a wide range of comedic styles. Daily workshops in improv techniques (long and short form) and sketch comedy are very popular. Campers try out their skills in our fully-mounted productions and at the end of the summer Festival. Seven days a week, from 9:00 AM to 6:00 PM, Buck’s Rock’s very own radio station, WBBC, broadcasts on its own frequency live from the Buck’s Rock campus. News, reviews, talk shows, radio plays, documentaries and recorded music are all produced and aired by campers working as announcers, script-writers and commentators. Experienced broadcast announcers help campers to develop program content and effective voice technique, using professional broad casting equipment. Our new Puppetry Studio is chock full of everything campers need to create the next Kermit, a simple face drawn on a hand, a re-purposed sock or cardboard box and any other materials that inspire. Within the newly built studio, campers will find state-of-the-art video production equipment that includes a green screen wall. You can bring your puppets to life in your own movie through the magic of technology. Your imagination’s the limit! We are extremely proud of Studio 59, our state-of the-art, professional grade, recording studio. Campers work with a staff team of engineers to make digital recordings using professional recording and mixing equipment. The studio is equipped with multiple amps, mikes, music-sequencing keyboard work station, digital keyboard and drum kit, sound booth, band room, isolation room and the most up-to-date Pro Tools software. Campers also learn editing and recording techniques with our engineers. Truly an enriching experience. Flame work introduces campers to a more detailed, finely controlled use of glass. Using blowtorches, campers shape and mold colored glass rods into beads, small sculptures and figurines. From small-scale sculpture to the infinite possibilities of beadwork, you can produce stunning and inventive art that can be enjoyed as is or incorporated into jewelry in the metals studio or as an accent piece in a variety of other projects. In our Painting Studio, campers of all levels of experience can work in different media on canvas or paper. Work with our professional instructors to draw, airbrush, collage or paint in oil, acrylic or watercolor. Spontaneity, creativity and personal expression are celebrated. Seminars, visiting artists and weekly drawing classes add depth to the painting and drawing experience. Bring your sense of color to the Weaving Studio. Use large and smaller table and floor looms to create blankets, shawls, ponchos, rugs and wall hangings, as well as fabrics for pillows, placemats, bags, scarves, jackets and vests. Off-loom tapestries and beltloom work can also be worked on most any where at camp. Campers in the Printmaking & Silkscreen Studio produce exciting, original graphics on posters, cards, fabrics, T-shirts and 3 D assemblages. The unique facilities of this popular studio rival college-level studios. Learn intaglio, woodcut, linoleum, and silkscreen — the opportunities for experimentation in technique are boundless. Batik is an ancient Indonesian process using colorful dyes along with a combination of bees wax and parafin to decorate fabric, wood or paper. Design and produce richly textured tapestries, wall hangings, fabric for pillows, quilts, garments and soft sculptures produced in conjunction with our Sewing Shop. Take a workshop in other batik related techniques such as tie-dyeing, shabori and marbling. And just like our campers, every batik design is completely unique! Our Sewing Shop is where campers can design and construct anything that can be made out of fabric –clothing, knapsacks, handbags, pillows, quilts, soft sculptures, stuffed animals, dolls… anything. Learn how to follow a pattern or create one of your own. Try hand-sewing, machine sewing, and learn how to use our computerized embroidery machine. The popular Festival Day fashion show is the perfect stage for showing off your Sewing Shop creations! Explore the art of paper making and book binding in our Book Arts Studio. Learn book binding techniques, use a letter press to print cards and stationery, and use materials collected from all around camp to make your own paper. The Pub Shop is responsible for virtually all publications produced at Buck’s Rock over the summer, including programs, mailings, and the orientation handbook. The hallmark and glory of Pub is our annual yearbook, produced by a hardworking team of campers, staff, and CITs, and showcasing the entire breadth and depth of what goes on at Buck’s Rock over the course of the summer. Our graphic design and layout staff is trained to assist with any and every project campers bring to the shop, from finding a research image for a Batik project, to designing their own business cards and zines. Publications also holds daily writing workshops on a range of topics including fiction, poetry, playwriting, comics, musical theatre, creative non fiction, writing nuts and bolts, and writing games. Explore different leather making techniques in our Leather Shop. Design your own creation, then dye, stamp and stitch. Bracelets, bags, wallets, belts...you’re limited only by your imagination! In the mornings, campers can enjoy private or small group instruction in tennis, fencing, martial arts and archery. Our beautiful pool is open afternoons and evenings for recreational swimming. During the early evening hours, campers may choose to participate in recreational team sports — softball, basketball, soccer, ultimate frisbee and volleyball. Some campers may prefer playing badminton, ping-pong or chess, or even take an early evening swim in the pool. And just in case the shop hours are just not long enough, each evening, the creative art studios take turns in opening their doors or sponsoring an activity where campers can get a feel for the medium. Later, campers may participate in the featured activity of the evening. With such a strong and diversified performing arts program, Buck’s Rock generates most of its own evening activities with camper and staff performances — dance, theater, clown/ improvisation, music and video. In addition, there are wonderful coffee houses, talent nights, rock concerts, carnivals, karaoke nights, informal social dances and movies. The day winds down as campers head back to their living areas for a well needed good night’s sleep. Full Season - Age 11-18. First Session - Age 11-18. Second Session - Age 11-18. Six-Week Session - Age 11-18.